Thar G Cutch Waste: Grey, olive green and turquoise. This dye is extracted from the waste of the first extraction from cutch. Cutch is extracted from the stem and bark of the Cutch or Katha tree (Acacia Cutechu)1. 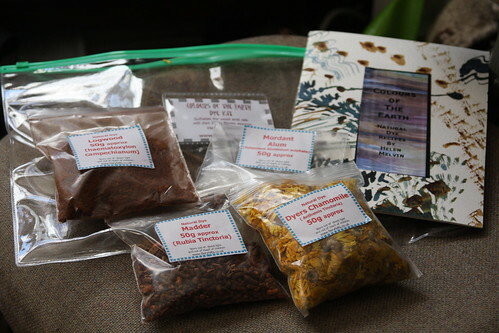 Ambrosia - Marigold: This dye is extracted from the African marigold (Tagetese erecta) and is larger than it's European cousins, the French marigold1. 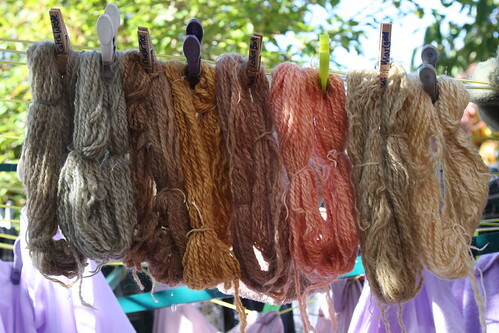 These are the colours again, in a slightly different order, and with the fibre... I particularly like the second one in - which is Lodhra bark. I did like these dyes, but they weren't quite as user friendly as the first ones. I struggle with unwrapping these tiddly plastic bags with gloves on, and I did end up with a fair amount over the surfaces, which I hadn't with the first lot. There was also the smell, that even the dog was not impressed with. That said, they were good value for money, but I did have to be organised regarding the mordant, making sure I had enough, so it required another thinking stage. This is the pack I started with either last spring, or it could even have been the year before !! I ordered them from Fiery Felts after they were reviewed in The Journal. When they plopped through the door, whilst I was pleased with the packaging and value for money, the doom and gloom came flooding back about the amount of preparation and forward planning needed. Even to do something as simple as soak the madder, I needed to find a sieve with which to wash it first. So on Monday I read through all the instructions, armed with the confidence of my initial forays into dyeing, worked out what I needed to get going on this project, and madder is now soaking for its first 24 hours. So - onwards and upwards - just had another distraction, therefore had a quick browse before coming back to finish this epic (as you do...).. Sassy Spinner has featured on her blog some really stunning jewel like rovings. 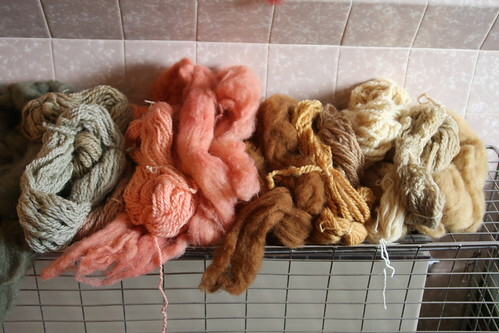 I particularly like the silks, but the stash pile just draws my eye.... especially on a day like to day...very inspiring. Now where did I put them?